In 1977, after a long and turbulent history, the islet of Molokini and the 77 acres surrounding it (including all underwater terrain) were declared a Marine Life Conservation District. The reef, birds, fish, and all marine life are now protected from fishing, collection, and any further destructive human behavior. Eco-tourism at Molokini has raised a level of controversy due to the amount of snorkeling & diving done in the area. In an attempt to slow use of Molokini, tour boats have been allocated specific moorings in order to protect the reef from anchors and to restrict the area to only a specific number of boats. Molokini is federally owned and protected as a Hawaii State Seabird Sanctuary. On and within the rocky terrain of the island atoll, you can find nesting seabirds. The Wedge-Tailed Shearwater are a large shearwater with thin beak primarily feeding on fish (mainly Goatfish) as well as crustaceans. Though thought to primarily feed on the surface, recent studies show that they can reach a depth of 216 ft (66m). The Bulwer’s Petrel are a small petrel with a rather long wing span and pointed tail. It feeds off of planktonic creatures on the ocean surface. They’re found to breed on north Pacific islands, China & Hawaii, after which the Bulwer spends most of the year at sea. Though Humpback Whales are not known to enter the shallow waters of Molokini Crater, they are abundant all around Molokini during whale season. Every year, Humpback whales migrate from their summer home in the Pacific North West back to Hawaii. They come to Hawaii (Maui in particular) in order to mate and give birth to Humpback calves. The surface behavior of our Humpbacks is truly awe-inspiring. As they compete for the affection of females, male Humpbacks display all kinds of surface activity as they battle with other males. They also sing complex songs that can reach other whales many miles away. When snorkeling or scuba diving, you’ll likely hear them singing, during season. White Tipped Reef Sharks are plentiful and harmless to humans if unprovoked. Tropical species of octopus also known as white-striped octopus. Manta birostris is the largest species of rays in the Myliobatidae family. Though they blend well with the reef, there are many eels hiding. The State fish of Hawaii. Also known as Humuhumunukunuku apua'a. Abundant and colorful on Hawaiian reefs. Spectacularly, they puff up in size when threatened. A very common fish to spot while visiting Molokini. Often can be confused with Cornetfish due to similar shape. Also the Red-Tailed Surgeon or Achilles Surgeonfish. 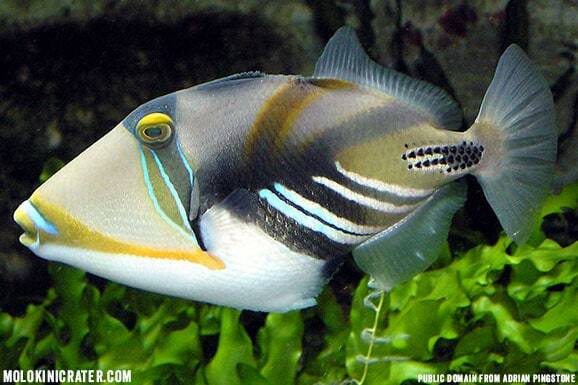 Also the Black-finned Triggerfish or Indian Triggerfish. Also the bluefin jack, blue ulua, & omilu. Also known as the convict surgeonfish. Also known in Hawaiian as Kihikihi. Probably our favorite fish to see at Molokini.